Anniesa Hasibuan certainly made a name for herself during New York Fashion Week. As Harper's Bazaar reports, the Muslim designer will go down in history for a couple of reasons: She's the first designer to present a collection featuring hijabs in every single look, and she's the first Indonesian to officially show at the event. How's that for boundary pushing? Not only was the collection historic, but it was also truly beautiful, featuring sumptuous fabrics and feminine colors. The brand explained on Instagram that the collection was inspired by the "colorful and vibrant world" of Indonesia's capital, Jakarta. "Famously known for its unique styles reflecting the rich cultural diversity, this Capital of Indonesia inspires Anniesa to once again present another remarkable face of Indonesian stunning ethnic mosaics," the brand captioned the photo. "For the patterns, Anniesa uses printing techniques for belt and batik to add the Indonesian touch." 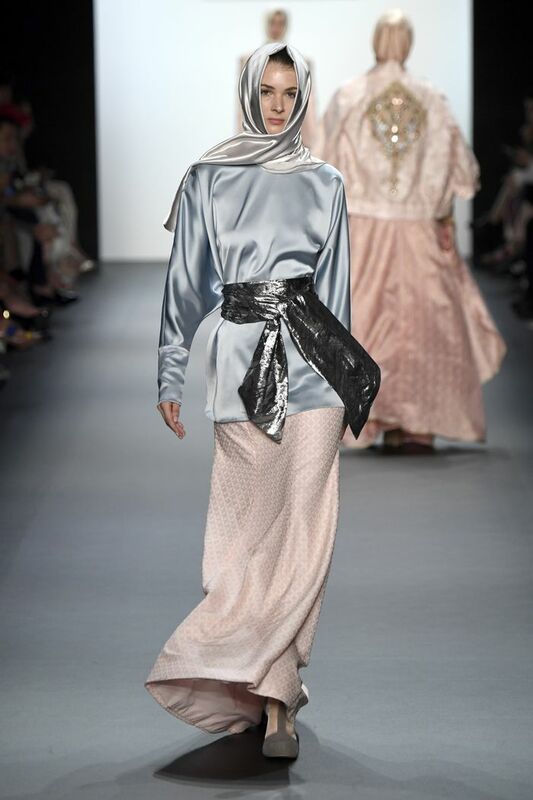 Scroll down to take a peek at Anniesa Hasibuan's historic collection at New York Fashion Week! What are your thoughts on the collection? Tell us in the comments below, and then shop Anniesa Hasibuan online.